These recipes can make a perfect feast. 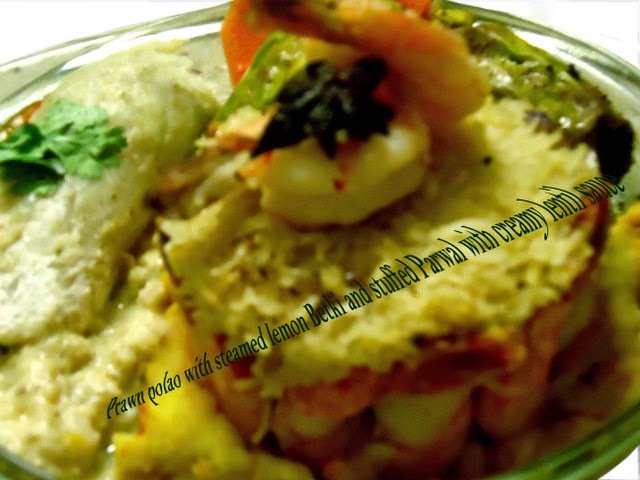 The prawn polao with creamy lentil sauce, steamed lemon bekti, nutty stuffed parwal and mango raita. These easy dinner recipes will help you to spread a traditional Indian platter on the table for any occasion. Even simple rice can be transformed into a dish fit for a King's palate by once culinary skills, polao or pilaf is an example of it. To make polao one has to buy old and fine long grain rice (basmati rice or chamarmani rice) while making the polao one has to be careful so that the rice does not get over boiled and freed from moisture. To attain the maximum moisture free texture of the polao there are some tricks. * One hour prior to cooking one has to prepare the rice synchronously along with the preparations for the rest of the cooking course. One has to wash briefly and soak the rice for 30 minutes then stain the water, spread the soaked rice in a wide platter and leave it to dry on open air for another 15 minutes. Lastly, to get perfect texture of the rice mix some ghee [clarified butter] or vegetable oil with the rice now, but very carefully since the rice should be fragile by now and can get broken easily. The oil or ghee will keep the rice separate during cooking polao. ** The mouth of the utensil in which the polao to be cooked should be wide so that its inside can be seen clearly and stir easily. *** Last, but not the least the secret of the mouth-watering and inviting aroma of the polao is the perfect blend of minimum spices. Traditionally it is used to be added in three steps: while making spice infused ghee and mixing that ghee with the set to dry soaked rice, while cooking final polao. **** If the recipe demands do not strain the starch after cooking the previously flavored rice, in general the proportion of boiling water for the cooking perfect rice should be 1:2 means 1 cup rice and 2 cup boiling water, but for the long-grain basmati rice the proportion should be 1 cup rice with 1 and 1/2 cup boiling water. Since during soaking rice it will drink approx 1/4 cup water and for this recipe one has to add 1/4 cup milk, the measurement of the boiling water for the cooking rice should be 1 cup only. The amount of water will also be depended on added vegetable or meat or egg or fish quantities to the rice for making polao and to cook them well. I have added prawn for this recipe and to cook prawn I do not need to add more water to cook unlike the other polao dishes. I seasoned the prawns well, fried a little to keep it soft and steamed with rice, that's it. 3. Salt and turmeric for seasoning , 1 teaspoon. 4. Hot boiled water , 1 cup. 6. Saffron, 1 pinch, toasted and powdered. 13. Vegetable oil , 3 teaspoon. 14. Salt and granulated sugar to taste. 1. Wash, clean and soak the rice in water for half an hour, keep aside. 2. After half an hour drain the soaked rice, scatter the rice on a platter to dry in open air for another 15 minutes. 3. In the meantime clean prawn, wash with salted lukewarm water, season with salt and turmeric, keep aside. 4. Take a pan, toast one pinch saffron on low fire, powder it with your finger and add to the lukewarm milk, keep aside. 4. Heat a pan, turn simmer, add 4 teaspoon clarified butter or vegetable oil of your choice, add Bengali garam masala whole spices and 1 teaspoon salt, let the spices slightly burn , take out the spices, but do not throw away. Keep the spiced infused clarified butter in another bowl. 5. Take 2 teaspoon spice-infused clarified butter or oil add to the dried rice, add ginger paste, mix carefully, keep aside for another 15 minutes. 6. In a pan take measured water for cooking rice, add those fried whole spices, add another teaspoon salt, turn fire on and keep simmer, let it boil slowly first , strain the spiced boiling water, keep aside. 7. Take a wide-mouth deep pan, heat oil, add sliced onion, slightly broken cashew nuts, star anise, curry leaves, silted green chili and the seasoned prawn. Fry until it becomes translucent in color. Add spiced rice, fry well carefully. Add hot spiced water and lukewarm saffron milk. Stir and cover with pan-lid. 8. After it starts boiling turn into simmer. If you can, add some boiling water carefully on the pan-lid, it will make the moisture from the top also. 9. It will take approximately 10 minutes to soak all the water and make the best flavored polao rice you ever had. Open the lid carefully, add rest of the infused oil or clarified butter, stir gently and turn the heat off. Give a standing time for not more than 5 minutes. Serve hot. * I did set the hot cooked polao rice in a panna cotta ring mold for 5 minutes. First I took the prawns from the rice and aligned by the side of the ring and then covered the empty area with cooked polao rice. It was so tempting in all the ways like eyes, nose as well as our tastes buds. ** Polao can be served with any semi-gravy preparation and raita for a full course meal. Take one cup unripe mango chunks in a bowl, add water and place it on fire to boil until the mango become slightly soft. Drain the water and keep aside to cool completely. Take half cup hung yogurt in a bowl, add chat masala about 2 teaspoon, add rock salt to taste and one pinch sugar, beat until smooth. Finally, mix yogurt and mango chunks and place it in the refrigerator, it should be served chilled with pinch of red chili powder.